Doesn’t time fly? Is it time to review the state of the Northern League, the competition scene in the North of England, once again? It appears so. It's clear that overall attendance has continued to decline and the downward trend from 2011 to 2015 cannot be ignored. As already mentioned, the main reason for the decline in attendance is continued fall in the numbers playing FOG AM. The 2015 average attendance for FOGAM was down a wapping 78.7% compared to its peak of 2011. The attendance for the final round of FOG AM was particulary poor with only 4 players turning up. I hope there was another event that drew some of the regulars away. The numbers playing FOG R are essentially stable with 4 teams playing in every road compared to 3 and 5 in FOG AM & DBMM respectively. The national decline in popularity of FOG AM v2.0 caused by the botched marketing by Slitherine and the lack of continued support. For the first time the rounds in the 2015 FOG AM competition were themed, as they will be in 2016, with each round having a different theme. 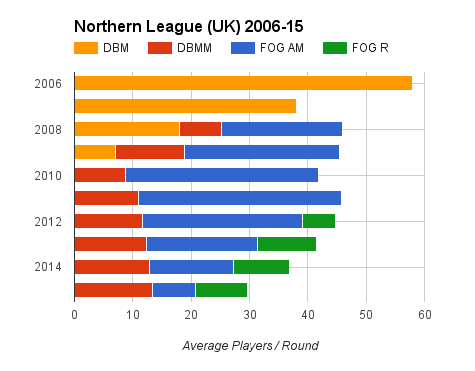 As the number of players decline, FOG AM v2.0 results in more protracted, and eventually drawn, games. To take each of these in a bit more detail. I’ve already covered the decline in FOG AM and the resulting fragmentation of the national ancient & medieval wargaming scene in last year’s review as have others. Suffice to say it’s difficult for any rule set to gain traction and critical mass at present. Likewise I have covered the botched release of FOG AM v2.0 by Slitherine many times before and there’s really not much new to say. Although common in one off competitions, themes always run the risk of excluding casual players because they don’t have a suitable army. Themes favours experienced players of long standing with lots of armies at their disposal. In addition, if you enjoy the whole “league element” but don’t have armies to play in enough rounds to be competitive there’s less incentive to play at all. I can’t help thinking that in 2015 this resulted in some players simply not bothering. Another issue for those that do attend to play FOG AM is that declining team numbers mean more protracted and drawn games. This is probably due to a combination of increased familiarity within a diminishing pool of players and the fact the remaining players are more likely to be both keen and experienced, and therefore harder to beat. The two data points on the far left are from 2014 (22.11) & 2015 (20.41). The basic trend from 2010-13 has clearly been confirmed. The “outlying” data for 2014 represents the switch from doubles to singles which possibly introduced some “novelty” into the League but the pattern reasserted itself in 2015. For those not familiar with how games are scored, a combined score of 20 is the lowest possible score for FOG in the League and only occurs when a game is drawn when time is called. Breaking your opponent gains the victor 5 bonus points. It is these bonus points that raise the average score above 20. Based on an average score of 20.41, most FOG AM games in 2015 appear to have been drawn. Whilst drawn games can be thrilling but they can also be boring especially if you know in advance that the outcome is likely to be a draw. 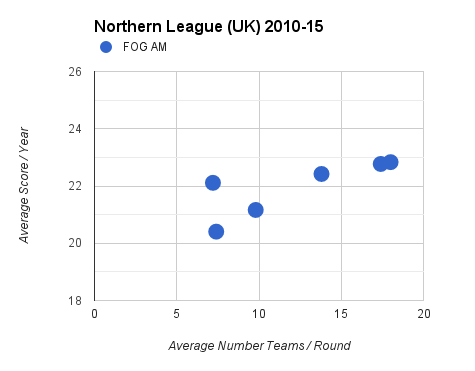 In contrast to FOG AM the average for FOG R games in the 2015 League was much higher at 22.82. In fact the average score in the FOG R competition has remained constant at 23.00 +/- 0.20 for all four years it has been run in the League. To sum up: given the above it is safe to conclude that 2016 will be a make or break year for FOG AM in the Northern League. 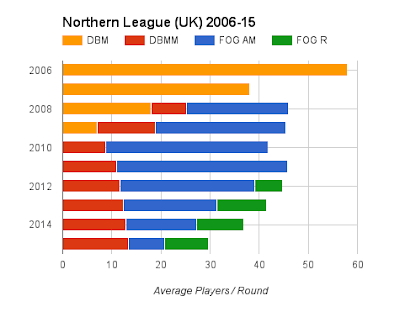 The League itself should be viable assuming that the number of DBMM & FOG R players remains healthy. Who knows perhaps some of the absent FOG AM players will return and spark the competition into life once again. Only time will tell. What about ADLG? That seems to be making a strong showing as a replacement for FOG:A in the tourny scene. Even the Mad Axeman (normally a rabid FOGger) has switched to it. Here in the USA, at the last Fall In convention, there were 12 players in the 15mm ADLG Theme and a whopping 22 players in 25mm ADLG open. Interesting point and I agree with you about ADLG. The stumbling block is that there would have to be a core of at least 8 ADLG players willing to support the League throughout the year in the hope of drawing in others. I also think they would have to propose it to the organisers. Antediluvian as always Tim: the decline in FOG began in 2011/12. Comments from TMP - for completeness. Martin, These are very interesting numbers. Any clue as to how they would look for the UK as a whole? Any data like this over at the SoA? Working on something now following on from a very interesting email. The BHGS website has historical copies of the AM and Rankings dating back to mid 2012, so the overall numbers of players entering events year to yearcan be easily seen. The MM rankings page I believe also allows historical data to be pulled out too. Sadly the available BHGS rankings don't offer much historical depth. I'm also not sure they would provide the same picture of regular wargaming: useful but different. "I just wanted to say that this was the first year that DBMM had themed periods too. So there were 4 rounds by date and the last being open. Despite this and grumblings from some players initially the participation held up well during the year. In a sense I think it helped because DBMM works really well in period so I guess everyone felt it was a more level playing field. I am not sure that anyone was put off by a lack of army for a period because the dates were set quite widely." The decline in ancients is more marked than your graph indicates as you include FoG R in the state which isnt a traditional ancients ruleset. Also Slitherine have just announced that once the paper editions of all the FoG rules are sold out they will not be reprinted as they are moving onto other projects. The graph is what it is. Remember the review is about the league first and foremost. It's easy enough to follow the decline of the blue bars if you want to exclude FOG R and compare with the decline in overall numbers. If you want more on just ancient & medieval wargaming look here. I also have a review of the BHGS Doubles in preparation. Should be ready in the middle of the week.